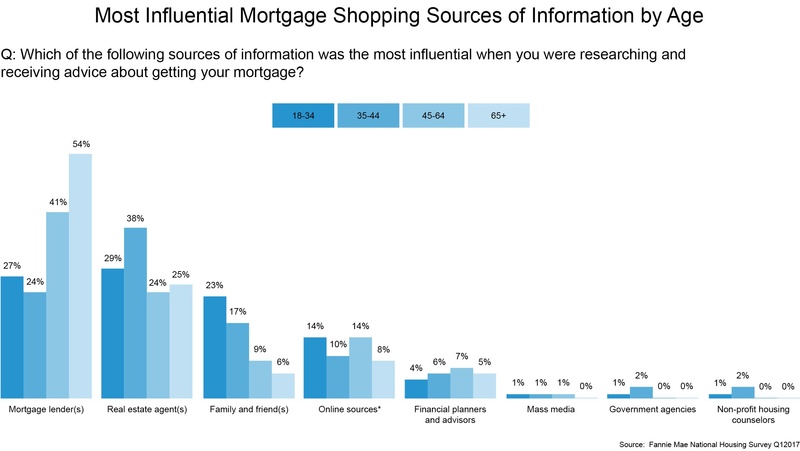 The most common sources of information recent home buyers consulted when shopping for a mortgage were Realtors, lenders, family and friends, and online sources. Recent home buyers used the internet and mobile devices to shop for homes more frequently than they used them to shop for mortgages. Mortgage lenders and real estate agents are seen as more credible and trustworthy than online sources. The human element is also still going strong: NHS respondents were almost twice as likely to want to use mobile devices for mortgage activities in the future. However, more than half of consumers surveyed indicated they would want in-person communication with their lender in the future. Full findings and methodology are available in the Fannie Mae National Housing Survey Topic Analysis - October 2017. Overall, the survey found that home buyers tapped the internet for shopping and people when it was time to buy. This might be a comforting takeaway for companies and producers, but a deeper look at consumer perceptions shows that mortgage lenders and loan officers scored lower than other influencers - specifically Realtors, family and friends - in several categories that are critical to long-term success in financial services. The NHS asked recent home buyers the reason they chose the source they did as the biggest influence in getting their current mortgage and they were given six options: trustworthiness, accuracy, credibility, convenience, usefulness and easy to understand. It's not surprising that people who went with online lenders cited convenience as the number one reason they selected that provider. 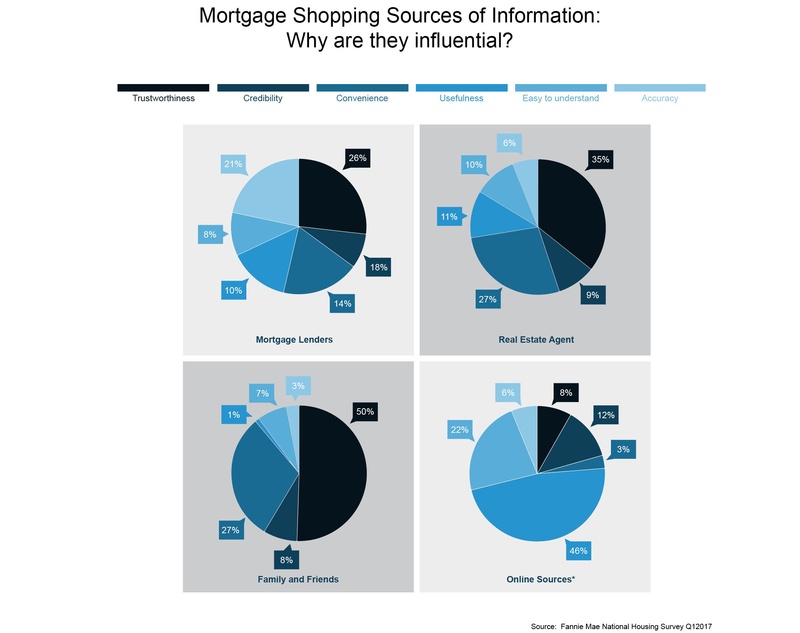 In cases where borrowers said the mortgage company influenced their choice of lender, the only area where they outscored other influencers was accuracy - but only 21% of consumers selected that option. Twenty-six percent of recent buyers said trustworthiness of the lender led them to their mortgage company, but that was far below the number of those who took recommendations from Realtors, friends and family for that same reason. This is a clear indication that mortgage loan officers and lenders have work to do. Mortgage lenders must improve how the public perceives them. The highest marks lenders received were for trustworthiness, but they didn't clearly dominate any influence category in the NHS. Lower responses for convenience or ease of understanding would seem less troubling if lenders had very high ratings in other areas such as credibility or accuracy. Companies must address this and choose an area of influence that they can own that corresponds with their brand, mission and vision, and deploy initiatives that clearly communicate this to consumers. In addition, companies and MLOs need to align with agents in their markets who have high trust factors. Realtors received far more pronounced results as reasons that home buyers cited them as the major influence in their lender choice: Sixty-two percent of respondents said trustworthiness and credibility of the real estate agent is what led them to choose a particular lender. You're not beating them, so join them. You can accelerate relationships with education-based marketing - learn more here: Make Inroads with Top Realtors, Teams and Offices. The Mortgage Bankers Association (MBA) prediction that home purchase originations will increase in 2018 to $1.2 trillion emphasizes the importance of influences when buying a home. Companies and MLOs need to do the internal and external work necessary to bolster the perception of their images in the eyes of the home buying public and increase the number of high value Realtor partners who refer business to them. The jump in purchase originations will happen at nearly double the rate they accelerated this year according to MBA, so companies must prepare now. Start with this question: "What are we doing to increase home buyer perception and active partner relationships?" The first step to getting in position for 2018 is to take an honest look at where you, your relationships and your perception are today.